JAMIE BREWER, the 30-year-old theatrically trained actress who’s starred in 3/4 American Horror Story seasons, has become the first ever woman with Down Syndrome to walk the catwalk in New York Fashion Week. Well, in any fashion week for that matter. The trailblazing advocate for disability rights and education, Jamie is passionate in her fight to raise awareness of all disabilities. Although she doesn’t believe Down Syndrome is a disability, she stands for those who are hit with disability stigmas in society. The actress spent years campaigning and successfully managing to have the word ‘retarded’ removed from the state legislation in Texas! What a girl! 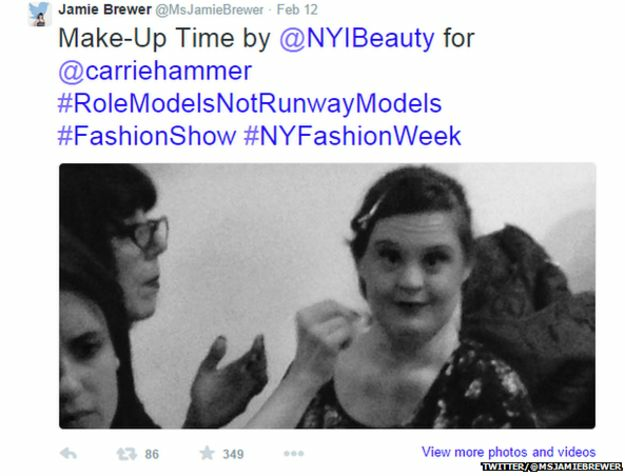 Jamie walked for Carrie Hammer, a designer who launched her Role Models not Runway Models campaign last year, and when approached by Katie Driscoll, founder of ‘Changing the Face of Beauty’ encouraged Hammer to put a disabled model on the runway, she automatically thought of Jamie. As Addie in Murder House, Nan in Coven and Marjorie in Freak Show, Jamie Brewer is an all round incredible person, and not because she has Down Syndrome. That doesn’t and shouldn’t define her. She’s doing things that others can, and her ‘disability’ is not a factor in her success. It just so happens to make her an even more impressive person though. She battles for education, acceptance, equality and diversity, and who can say those aren’t all honourable battles? Good job, Jamie. You’re wonderful and we don’t doubt we’ll see you even more this coming year!